We aim to live our lives through worship, prayer and example, developing our discipleship and inviting others to know Jesus Christ as Lord and Saviour. In all our being and doing, to be open to the leading of God through the Holy Spirit, that we might fulfil God’s purposes in Navenby and surrounding villages. 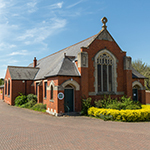 To find out more about Navenby Methodist Church, or to enquire about hiring the church building, please head over to their lettings page by clicking here or email navenby@lincolnmethodist.co.uk to contact the minister.